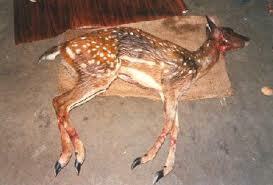 Life For Animals: Drinking Deer Blood!!! Recently, a section of the rich Chinese people celebrated the mid - autumn moon festival by drinking the blood of freshly slaughtered deer!! A private deer breeding farm near Nanjing did brisk business as people traveled from distant places to see the farm owner drink the flowing blood straight from the cut horns, the Nanjing Morning Post reported. Some drank the fresh blood in small cups, some mixed it with liquor and a few drank it straight from the cut antlers. People visiting the farm subscribe to an old notion that drinking fresh antler blood can cure several ills and hugely improve their health! Sometimes, I wonder how many health problems the Chineses are suffering from! They eat tiger parts and other animals to increase their sexual power! And now this deer blood to cure them of some illness! This is a shame that instead of visiting a doctor or getting expert medical advice, cruel humans are butchering innocent, defenseless animals in the name of curing some mysterious disease. This is simply outrageous. The government, which must take steps to stop this mindless violence against animals, is being a mute spectator and doing nothing. The government officials must be drinking innocent deer blood themselves! we all have to raise our voice against such cruel atrocities and save our animal friends before they are all extinct!